One of the most attractive things about the impressive VW Caddy is the range of combinations which come from having three body styles. In addition, in early 2014 Volkswagen unveiled a BlueMotion version of the van to help deliver excellent economy figures too. There are long- and short-wheelbase versions (though the longer version is really the VW Caddy Maxi) but VW also produce a people carrier version, a crew van and a camper van alongside the panel van version. Some aspects of the design are looking dated but the van itself is still a winning combination. The Caddy is pricier than most of its rivals but it’s a solidly built van which offers a great ride and a big load space. For many people the VW Caddy is a winner and the addition of MlueMotion helps to make it even more popular and with low running costs, it’s also got an extra reason for buying. The VW Caddy has a solid feel, as you would expect from the firm, but it also has high levels of comfort and the interior is made from high quality materials. There’s not a lot out there to compete with this van. However, it is on the pricey side but it does offer lots of space and it has the best ride in its class, thanks to the VW Golf chassis that it is based on. The van should take a lot of punishment and is an ideal choice for anyone wanting to shift loads over a long distance – the van is cheap to run and comfortable to drive. 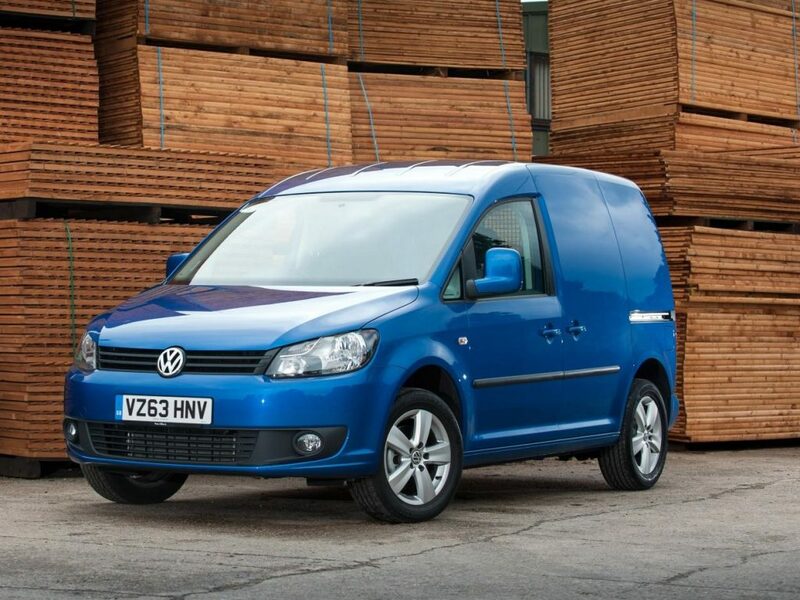 On top of this the VW Caddy is also a regular award-winner and is renowned for being reliable. For anyone wanting car-like abilities and convenience in a great small package then the VW Caddy is an ideal van to run. If you like the VW Caddy, then have a look at the Ford Transit Connect, the Mercedes Citan or the Renault Kangoo. The VW Caddy BlueMotion is the most economic version of the van, though it’s only available in the short wheelbase versions only. Under the bonnet is a common rail 1.6litre TDi direct injection engine which will produce 102PS and 250Nm of torque. There’s also energy recovery, reduced ride height to reduce drag, rolling resistance tyres to reduce friction and efficient engine control which means the engine is lighter with better calibration. This means that economy is 61mpg on the combined cycle which is 12mpg more than the base version of the VW Caddy and it has CO2 emissions of 119g/km. For the average owner, VW says they should see annual savings of £744 compared with the Caddy’s 1.6litre TDi 102PS model. While the insurance group for the Caddy is higher than for many rivals, the van has service intervals set at 15,000 miles or 12 month. Again, some rivals offer longer intervals. The VW Caddy also comes with the three year warranty, or 100,000 miles. 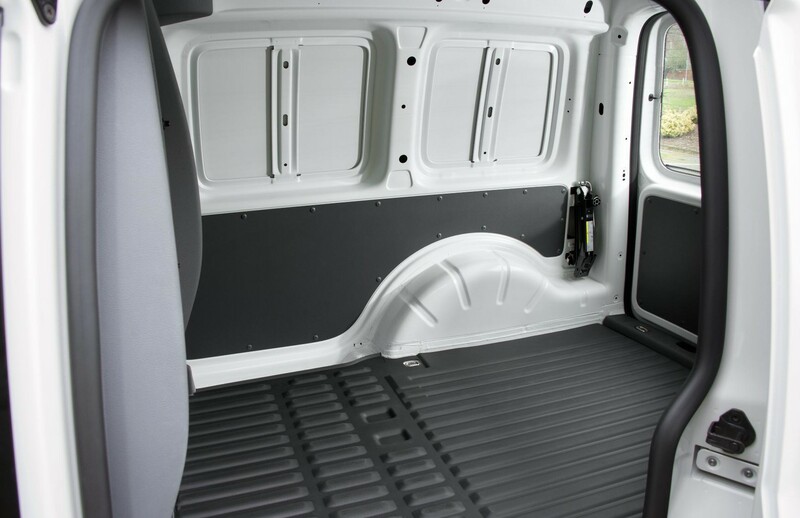 This is an area in which the VW Caddy really does score when compared with its rivals – it’s among the largest load space for its class. 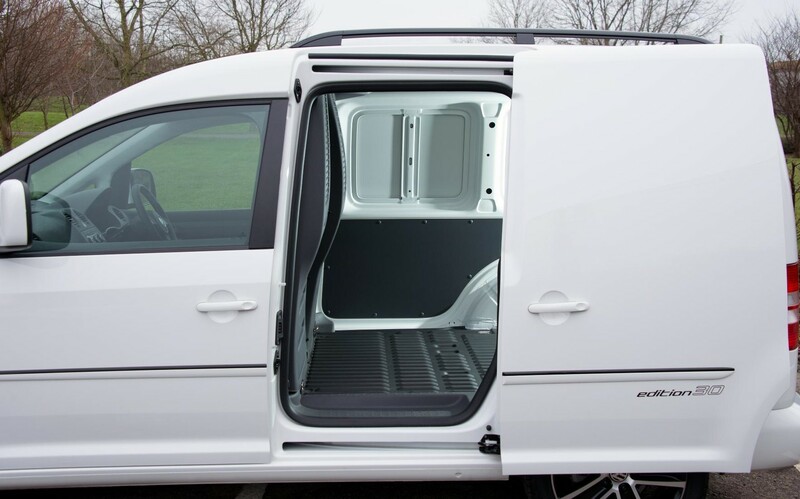 The smallest VW Caddy panel van has 3.2 metres cubed of space while the VW Caddy Maxi panel van has 4.2 metres cubed of space along with a load length of 2.25metres. However, its maximum cargo weight is 750kg which some rivals can easily beat and the Caddy can also take a Europallet. That’s only possible lengthways because of the gap between the wheel arches. Access to the load space is also helped by the side door, though it should be noted that this will not take a pallet – and neither will many of the Caddy’s rivals. There’s also a good range of lashing rings in the load space. Only the VW Caddy Maxi comes with a full height steel bulkhead as standard – other models have a half-height solid bulkhead in its place, though it can be optioned. The upper half is a plastic mesh which doesn’t offer the same level of protection should a heavy load shift in the load space. However, electronic stability control is fitted as standard which few rivals can match and there’s also a driver’s airbag. Other airbags can be optioned. The models also have cruise control, start-stop technology and hill-hold assist. There’s also anti-lock brakes with electronic brake-force distribution and to help prevent the potential for swerving or skidding even more, VW have also added electronic brake differential. In its normal guise, the VW Caddy has either a 1.6litre or 2.0litre diesel with a range of power outputs and the all come with the option of a BlueMotion tech package to add things like cruise control and energy recovery to help boost economy. In the 1.6litre diesel with 102bhp, the VW Caddy van with the BlueMotion package will help improve economy from 49mpg to 55mpg and cut CO2 emissions to 134g/km. Opt for the excellent twin-clutch DSG automatic seven-speed transmission and performance for the VW Caddy remains impressive. Don’t be fooled into thinking that the 1.6litre TDi engine isn’t good enough for a full payload: this engine replaced the popular 1.9litre version and has plenty of torque to shift a full van at low speeds. The 1.6litre also has a five-speed gearbox whereas the 2.0litre has six gears which helps on long motorway journeys, though this can be a noisy experience without the full steel bulkhead to help quieten matters down. However, underneath all of this is the tried and tested chassis from the VW Golf which means that the handling is really impressive. It’s not just car-like, the van enjoys being pushed and offers true steering, even in tight corners at speed where this is no lean. For many people the VW Caddy is the best in its class for driving abilities and that’s something we wouldn’t disagree with. 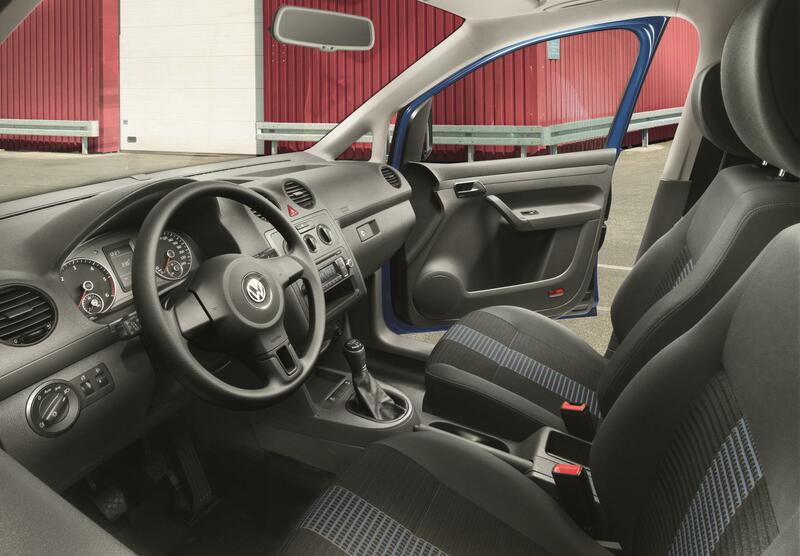 The interior of the VW Caddy is very well designed and everything is close to hand, the driver’s seat is comfortable and adjustable and there’s plenty of storage areas in the van too. There’s also BlueTooth connectivity, power assisted steering, immobiliser and hardboard roof trim and painted half-height side panels. Other models come with remote central locking and automatic hazard lights that switch on automatically in hard braking.